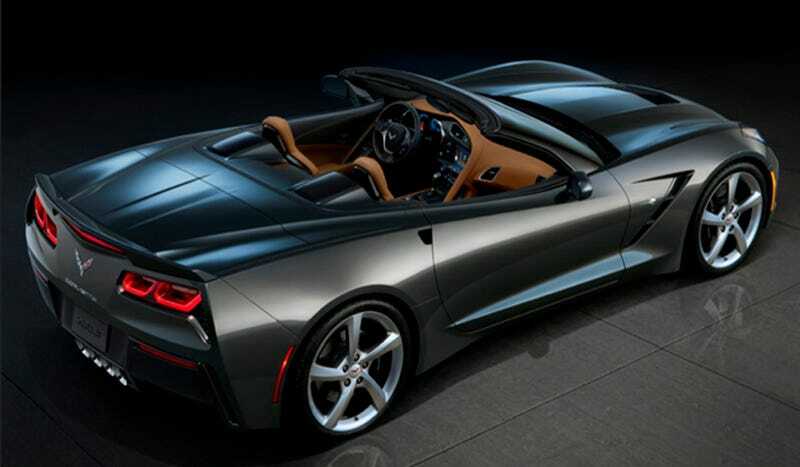 The 2014 Corvette has been around for a while now. I like it. We saw the front of it the other day. I liked it. Here's what it looks like from the back with the top lopped off. Guess what? I still like it. As expected, the Stingray 'vert has a soft top, not a retractable hardtop. It's hidden by a double bubble hard tonneau cover when down. When up, it gives a kind of coupe feel. Not bad. The Stingray Convertible does lose the side vents that are out by the rear wheels. Apparently this is so the top can actually retract and fit. Other than that, every controversial/awesome (depending on what you think) body panel looks to remain intact. We'll have full details on the soft top Vette when the covers are officially taken off at the Geneva Motor Show tomorrow.